A groundbreaking exhibit about the slaves and slaveholders who worked and resided at a distinctive plantation in Tennessee will open next year at the Tennessee State Museum in Nashville. The exhibit, Slaves and Slaveholders of Wessyngton Plantation, looks at the lives of both the enslaved African Americans and their white owners on the 13,000 acre plantation in Robertson County, Tennessee. The exhibition, which is free to the public, will open Feb. 11 and close Aug. 31, 2014. Through first and third person accounts, the exhibit will reconstruct the lives of several enslaved people, giving them names, faces, and the details of what happened to them before, during, and after the Civil War. Among the slaves profiled in the exhibit is Jenny Blow Washington. The founder of Wessyngton Plantation, Joseph Washington, purchased 10-year-old Jenny and her sister from a Virginia planter in 1802. The sisters traveled to Wessyngton Plantation in Tennessee with Washington, never to see their mother again. Although slaves could not legally marry, Jenny had a lifelong relationship with a slave named Godfrey Washington and gave birth to at least nine children. Jenny and her family performed the chores involved with maintaining the large Washington house. Her known descendants number in the thousands. The plantation was established in 1796 by Joseph Washington, who moved to Tennessee from Virginia, and was later inherited by his son, George A. Washington. The Washingtons, through their business dealings, became incredibly wealthy, owning not only Wessyngton but also property and slaves in Kentucky. Wessyngton was one of the largest plantations in Tennessee in 1860 and the largest producer of tobacco in the U.S. In 1860, the Washingtons were one of the wealthiest families in Tennessee. The Washingtons, with two exceptions, never sold their slaves, and by 1860 owned 274. Slave families at Wessyngton had three to five generations living together, remarkable in a system that often separated enslaved families, including selling children away from their parents. The Washingtons, who held on to their wealth during and after the Civil War, retained detailed records about their plantation and slaves. These records, along with letters and diaries, survived into the 20th century and were later donated by Washington family descendants to the Tennessee State Library and Archives (TSLA). These records were researched at TSLA by a descendent of the Washington slaves, John Baker, Jr., who had seen a photograph of the former Wessyngton slaves in his seventh grade history book. His interest was actively engaged when his grandmother told him that he was related to them. He later met a Washington descendant, who invited him to visit Wessyngton. John did go to the plantation and said “visiting Wessyngton was like stepping back in time.” There he saw a portrait of his great, great grandfather hanging on the wall, along with portraits of other slaves. As an adult, Baker spent years going through the Wessyngton records at the TSLA. He also interviewed many individuals, ranging from 80 to 107 years old, who were children or grandchildren of the Wessyngton slaves. Baker later wrote a book, The Washingtons of Wessyngton Plantation, about his lifelong research. This book inspired the Wessyngton exhibit and Baker worked closely with the museum curators as a paid consultant in the development of the exhibition. 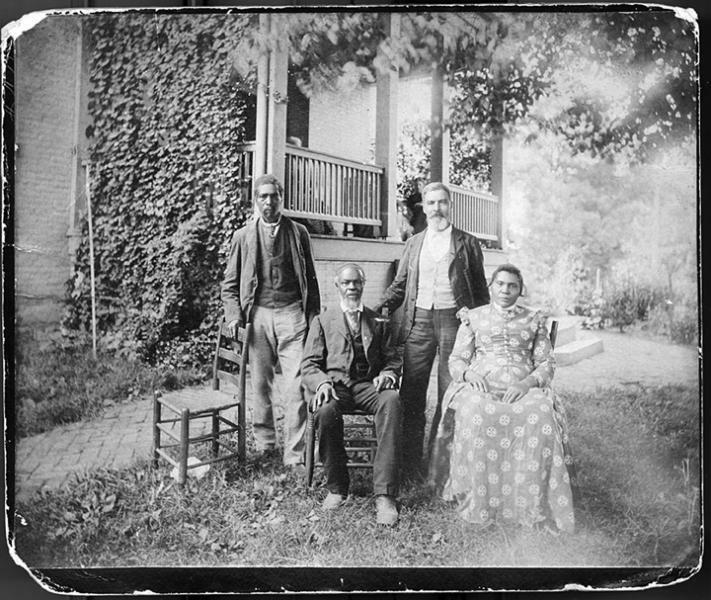 Baker was also able to locate photographs and drawings commissioned by the Washington family of the former slaves who had remained to work on the plantation after the Civil War. These drawings and photographs remained in the Washington and slave descendant families. The exhibit also looks at the important roles of the white women of the big house: Jane Washington, George A.’s wife, and her mother-in-law Mary. Together they supervised the production of finished clothing for the family and slaves. Such a large labor force meant hundreds of garments had to be produced each year. They also oversaw the food rations for the slaves, which according to the records, totaled as much as 42,000 pounds of pork consumed per year. At the end of the exhibit, a section called “Legacies” will trace what happened to several of the Wessyngton slaves after the Civil War into the 20th century. This exhibit is funded in part by a grant from Humanities Tennessee, an independent affiliate of the National Endowment for the Humanities.